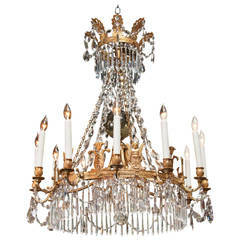 A beautiful Italian thirteen-light hanging fixture or chandelier of gilt metal and crystals, in the Empire style, featuring a crown over cascading pendants, with a ring of ten lights around the circumference surrounding a three light center, and graduated pendant base. Measures: 26 inches diameter U.S. wired and ready for display. A large and impressive Empire style bronze and crystal pendant chandelier with graduated square crystals beads and gilt bronze hardware. Newly rewired. France, early 20th century. 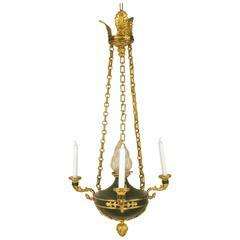 A twelve-light, fine quality, doré bronze, Russian neoclassical Empire chandelier with crystal drops.